Historic memory has been rather unfair to the wives of Frederick Douglass. Simply told, Douglass’ first wife couldn’t read and his second wife was “second-rate.” These attitudes still exist to this day, just ask the Park Rangers at the Frederick Douglass National Historic Site (FDNHS) who field questions from the general public seven days a week. The forthcoming work of Dr. Leigh Fought should help to eviscerate these fallacies which have held the minds of both the general public and insular academics for decades. 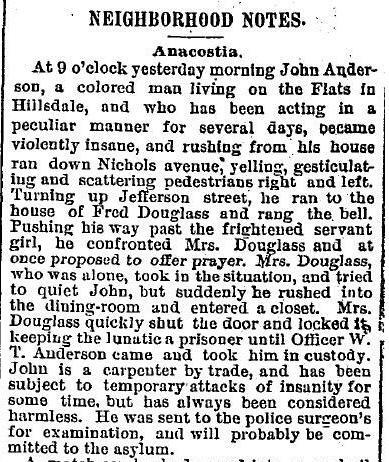 One of the more interesting items I discovered going through thousands of newspaper stories was this one from January 1889 which ran in the Washington Post. The text speaks for itself and I have been told by staff at the FDNHS that this story has helped calm the nerves of some visitors who rush to uninformed judgments about Douglass’ second wife, Helen Pitts.